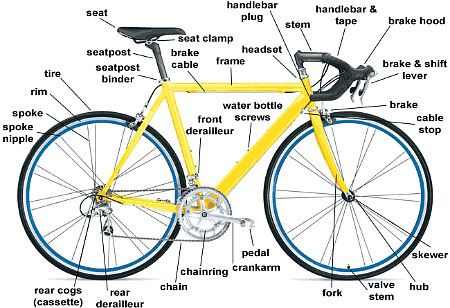 Knowing bicycle anatomy helps you know what that do-hicky is that turns the whatchamacallit on your bike. Of course, you can always ask your bike shop but it's kind of cool to know yourself. And if god forbid, you need to replace it you will at least know what to look for. Also, you can dazzle your friends with your new-found knowledge. 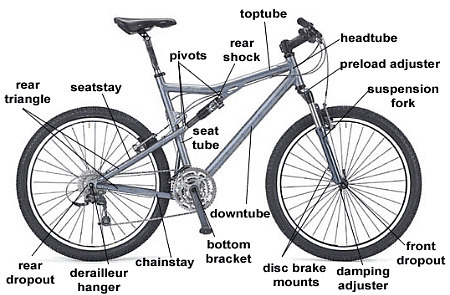 The images that are shown below of the road bike and the mountain bike, while very different, have the same basic components. There are a few differences like the suspension fork on the mountain bike or the drop handlebars on the road bike. Although they are configured differently a frame is still a frame and handlebars are still handlebars etc. The components may differ, to accommodate different bicycle styles and riding conditions, but the names and functions are still the same. There are many other styles of cycles besides the road bike and the mountain bike but the key components of a bicycle, tricycle, or recumbent remain basically the same.